A couple of days ago Cocoa was showing up in my office again. Like the last time right before she's ready to lay eggs, she gets extremely restless and needs to walk around a lot to exercise her muscles, obviously. She once again managed to climb out of her pen (if I only could see how she's doing it) and walked for hours around in the house. I am always afraid, she would have an accident on the carpet, but she behaved very well and didn't soil my floor. 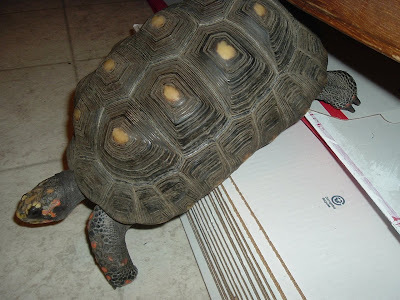 After 4 hours she walked back into the tortoise room, how she's always finding back, gives me something to wonder, and scratched with her legs on the outside of the pen, so I could hear her and put her back. 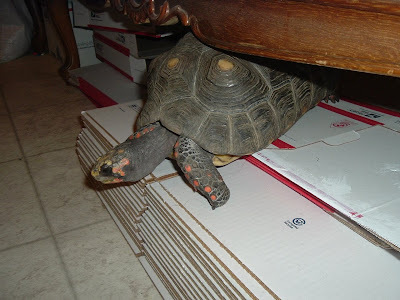 I'm pretty much aware of the fact that I have a very intelligent tortoise here, basically a one in a million. This girl is acting like a human being, she knows exactly what she has to do to get help, when and how to ask for it. The next day nothing happend and she did only try to climb over to Daisy's pen that is right beside hers. Not sure, what she wanted there, because I made a huge pile of soil for her in her pen, that she can use to dig an easy hole for her eggs. But she ignored it and didn't give up trying all day long to climb into Daisyboy's pen. Today she managed it and what do I see now? She is digging her hole in Daisy's pen, where there is only mulch, no soil and not even piled up. Who understands the mind of this tortoise woman? This will be a royal PITA for her to dig a hole deep enough in this mulch. Geez, like always, when I want to make a picture, my batteries die.....Charging right now, pics will follow. I hope she doesn't abandon this hole, I want it to be over now. She is keeping me from work all day long when she wants to lay eggs, because I am probably more nervous than she is herself and always fear she may become eggbound. And here is the pile of soil in her own pen that I had prepared for her. After Cocoa had walked for several hours around in the house, (God thanks she had made her business just before she climbed out of her pen) she obviously decided to go back into her pen and walked straight to her home. She stood in front of the pen and looked up to me to tell me, that I need to lift her up and help her go back in. Ok, we don't need any words, the understanding between us has developed to an unspoken act of gestures and body language, so I know exactly what my girl wants. I lifted her up and she started immediately to dig a hole. Oh my, I almost knew it, that's why she became so restless today and needed a big walk. It took her several hours to complete the job of laying 3 eggs and covering up the nest and right around midnight she went to sleep. I carefully dug the eggs out and threw them away. Yep, I won't breed any more, can't deal with the pain to give those cute babies away. It was an awful experience last year to separate from all my babies and I have decided to not put myself in this position any more. Not sure, how she did it, but I was sitting in my office on the computer and all of a sudden felt something climbing on my feet. When I looked down, I saw Cocoa. 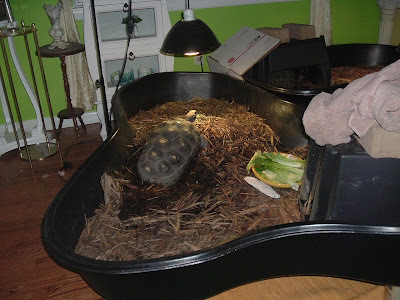 She managed somehow to climb out of her pen and land on the feet, when falling on the floor. Obviously she was inspecting her new surroundings and the USPS boxes that I have stored in my office caught her special attention. She climbed on top of them to then slip down on the floor. I am German and moved to the US in 2003. Since 28 years now I am a cancer survivor and want to share my story with you - how I healed myself the natural way, and how it changed my life completely.